Abram's Delight is the site of five generations of the notable Hollingsworth family of Winchester, Virginia. When Jonah, the third generation, took possession of the property he added the west wing, the attic dormer windows, and the front portico. He made these changes to accommodate his large family of 13 children. The family operated a mill on the site which is the second structure pictured. 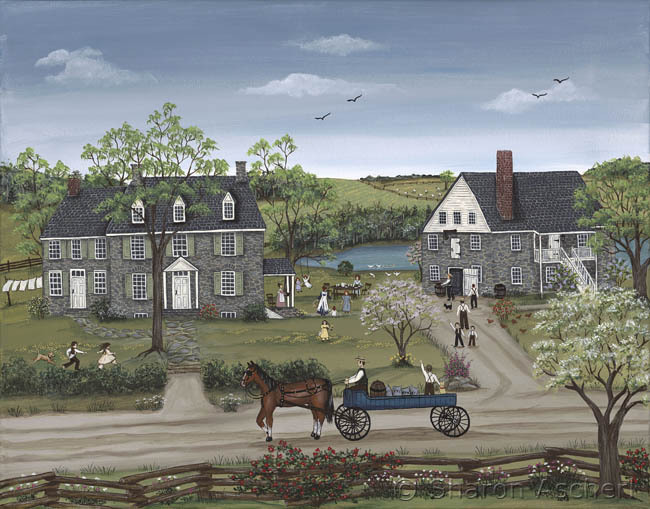 My painting shows a spring day and the family being gathered together to sit down and enjoy a meal outside.